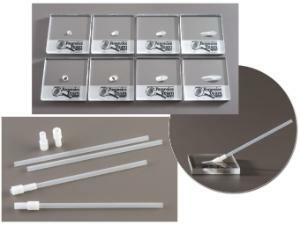 Follow the path of a bullet from weapon to victim or surface using the components of this ballistics set. Two sets of predrilled plastic blocks simulate the holes produced by 9 mm and .45 caliber bullets entering at 30, 45, 60, and 90 degree angles. Mount the blocks on a wall or any surface and determine trajectory using either trajectory rods or string, available separately. Set of 8 blocks. These affordable polypropylene trajectory rods come with interchangeable tips designed to fit either a 9 mm or .45 caliber bullet hole. Size of each rod: 7 1/4"L x 1/4" dia. Set of four rods.